When Boston-area native Jeff Barton turned pro in 1989, he started his career more than 3,000 miles away, in Spokane, Wash. Despite the distance, his father made it a point to get out to Spokane to see his son, the son told The Spokane Chronicle. And he was out there for a week. "He looks at this as a once-in-a-lifetime experience," the younger Barton told The Chronicle that August. Barton's baseball career was just about that. He played just that season and the next, never making it above single-A. For Barton, though, he's ended up having more than one once-in-a-lifetime experience. In 2013, the then-health care company executive, had what some might call another once-in-a-lifetime experience. At a charity golf tournament in New Mexico, Barton hit a hole-in-one. In doing so, he won $1 million. Barton's baseball career began that year in 1989, taken by the Padres in the 24th round, out of Princeton University. At Princeton, Barton won an award two years running for his fielding, hitting and defense, the William J. Clark Award. He was captain of his 1989 team. He also had a career batting average of .356, still good for third all-time at the school. With the Padres, Barton started at short-season Spokane. He hit .275 over 68 games. He also knocked in 47. 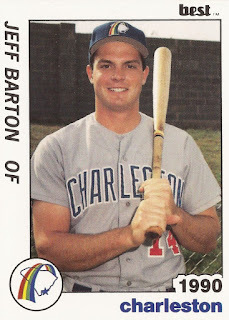 Barton moved on to single-A Charleston for 1990. In 84 games, he hit .230 and recorded 39 RBI. It was his final season as a pro. His playing career over, Barton eventually went into the health care field. In 2007, he became vice president at MobilexUSA in the Boston area. In August 2013, Barton traveled to New Mexico to take part in a golf tournament his company helped sponsor to raise money for a local high school, according to The Albuquerque Journal. He was also among those selected the Corley’s Albuquerque Lincoln Volvo Million Dollar Shootout where a hole-in-one was worth $1 million. "It's crazy," Barton told The Journal afterward. "It's taken on a life of its own. It's incredible and exciting for myself, and for the folks who were part of it."